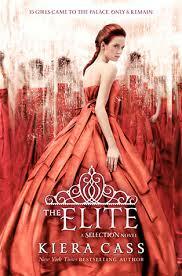 The pool of potential brides for Prince Maxon has been narrowed from its initial thirty-five to the final six. America Singer, one of the remaining six is under more pressure than ever to choose the man she will spend her life with: the kind-hearted future ruler, Prince Maxon or her first love, the charming castle guard Aspen. All sixteen year-old America Singer wants is to save her earnings as a musician and begin a new life with her secret love, Aspen. Her family, especially her social-ladder-climbing mother would never approve of America marrying a class beneath them, and when Aspen withdraws from the relationship because of the class difference, America despairs. Though she once considered it a nightmare, being chosen for the Selection, a group of girls spirited away to the palace from which the prince will choose a bride, now seems like America’s only escape from her heartache.